This lock is so large that, when you see it from a distance, you figure you are almost there. 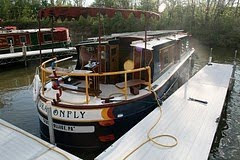 It's only when the lock opens and a teeny-tiny boat emerges that you realize you are still a mile away. The lock in question is the Wilson Lock (and Dam) on the Tennessee River, near Florence, Alabama. Fellow boater Mitch Brodkin took the amazing photo on the preceding page, showing Dragonfly (on her way back from the rendezvous), exiting the lock after being lowered 94 feet straight down. The story of the Wilson Lock and Dam is a story of superlatives. 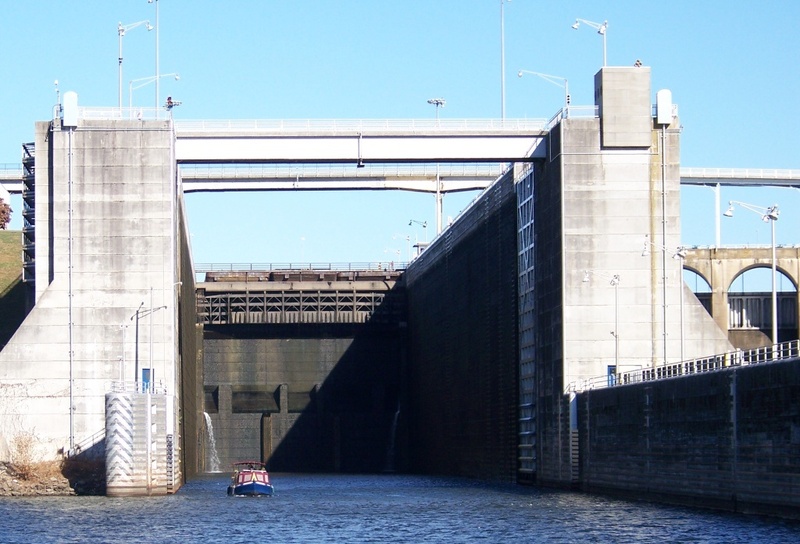 Today it's the tallest lift-lock east of the Rockies; at the time it was built (construction started in 1918 and was completed in 1927), it was the most ambitious public works project of the era and the tallest concrete lock-and-dam ever built in the United States. (You'll remember from our visit to the Peterborough Lift Lock in Ontario that, at the turn of the 20th century, concrete was quite an innovative building material). The dam was also our government's first-ever federal hydroelectric project (it was conceived of before the TVA was established; in fact the construction of this lock and dam inspired President Roosevelt to CREATE the TVA). And it was also the first time the U.S. Army Corps of Engineers built a multi-purpose dam (besides generating power, the structure allowed big boats to get past the rapids at Muscle Shoals, aiding commercial navigation; it's also used for flood control). Here's an interesting sidelight in history: Shortly after construction on the dam started, in 1921, automotive tycoon Henry Ford offered to buy it for $5 million (or possibly lease it--sources differ on this point). Ford imagined building fertilizer plants and turning the town of Muscle Shoals, a sleepy cotton town, into a metropolis. He pledged to employ a million workers in new auto plants. Since the initial cost of construction was more than $40 million, the numbers hardly added up. Not to mention the issue of a government-created resource in private hands. The government said "no" to Henry. The dam stayed in public hands. These days there are taller locks--for example, the Ice Harbor Lock on the lower Snake River in Washington State raises and lowers vessels 103 feet. But Wilson Dam still generates more than 600,000 KW of power, making it one of the highest-capacity hydroelectric plants in the nation. As large as the Wilson Lock is, it's not large enough for the towboats that pass us daily. The lock is 600 feet long, while a tow three barges wide and five barges long can exceed 1000 feet. So to pass through the lock, tows this size have to be untied, locked through in two passes, and then reassembled, which is time consuming and costly. We waited for about 45 minutes--a minor delay--before locking through on our west-bound journey because a tow emerging from the lock was being reassembled. Back on the Mississippi, we passed the site where the Olmstead Lock, 1,200 feet long, is being built to replace two older, smaller locks. Proposals to expand OTHER locks here and on the Mississippi are controversial and, in the present climate, unlikely to move forward. Advocates argue that bigger locks would reduce shipping times and encourage barge traffic, which as we've learned is THE most fuel efficient way to transport goods around the United States. Less fuel burned to move the same amount of stuff--sounds good. On the other hand, some analysts say the economic impacts of lock expansion are inflated. Meanwhile, environmentalists are concerned that bigger locks and increases in barge traffic will have adverse environmental impacts on river systems--more silt, more erosion, wetland habitats sacrificed to create deeper pools behind dams. It's not headline news, like an oil spill or a war. But it's an issue that merits more scrutiny--and more data. Wow. And consider that up close, the Dragonfly looks pretty big. This is a pitiful truth. I don't think a lock will be our best assurance and that causes considerably more pressure. Where Can I Get Me Some Solar Panels?